If you have a South Indian friend, you are blessed to enjoy a special experience that others would have no clue about. The kind of impact that this special friendship can have on someone’s life is hard to believe. From including words such as Aiyyo and Da in regular vocabulary to starting to look at South Indian films from a more serious angle to discovering the unique taste and flavour of South Indian sweets, the list can go on forever. Oliver Wendell Homes Sr once said, “But friendship is the breathing rose, with sweets in every fold.” It is clearly one of the sweetest definitions that demonstrate the true spirit of friendship. When it comes to South Indian cuisine, what is the first thing that strikes your mind? Dosa, idli, sambar, and vada? Those are surely special, but the mouth-watering delights of the South don’t end just there. The exquisite taste of authentic Mysore pak or Tirunelveli halwa will excite any taste bud and will make your heart desire for more. You must try the wide range of unique jaggery-based and sugar-based South Indian sweets if you have a sweet tooth. It is said that the word payasam has been derived from ‘peeyusham’, meaning ambrosia or nectar. An absolute must-have during special occasions, payasam enjoys a permanent place in traditional South Indian thali. Authentic payasam is made of jaggery and coconut milk, giving it a taste and flavour that people will kill for. Author’s tip: If you wish to try preparing this unique delicacy at home, you can use your creativity to make it your signature dish. Try adding mango, carrot, or pineapple for a flavoured variety. You can also use crushed dry fruits for topping. Want a detailed recipe? 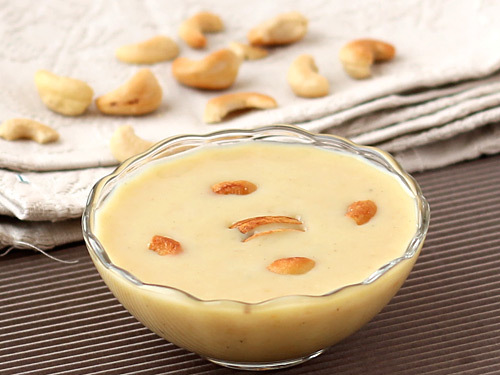 These 5 different Payasam recipes may help. You may also want to watch the following video of Chef Sneha Nair. Known as the king of South Indian sweets, Mysore pak was accidently invented by a royal cook named Kakasura Madappa in Mysore. This mouth-watering treat is made using pure ghee, milk powder, and sugar. The unique taste of authentic Mysore pak is simply irresistible and will force your heart to crave for more. Check the following video by VahChef out. Originally from Andhra Pradesh, this deep-fried treat symbolises festivities and joy. The filling of boorelu is a mix of Bengal gram, sugar or jaggery, coconut, and cardamom powder. The batter is made of rice and Bengal gram. This golden-brown dessert is one of the most special South Indian sweets that is fast gaining popularity in all parts of the country. Loved by all age groups, boorelu is a must-have speciality of the South. A speciality of Tirunelveli in Tamil Nadu, this lip-smacking treat boasts an unmatched flavour and a unique aroma. Tirunelveli halwa is made of pure cow ghee, wheat, and cashew nuts. This special dessert is prepared with water from the river Thamirabharani, making it unique and a must-have. A wholesome treat, Tirunelveli halwa is a delicious delight that can make any occasion memorable. Use the following video to try making this at home. Similar to modak, this sweet dumpling is made of rice flour and has a filling of jaggery or grated coconut. This South Indian delight is mainly associated with Lord Ganesha and is a must-have during Ganesha Chaturthi. You can enjoy this unique treat as a snack to go with tea. If you wish to try making this speciality of the South at home, try adding some dry fruits to give it a crunchy feel. Also known as maa ladoo, this South Indian speciality is a protein-rich dessert that is believed to have originated in Tirunelveli (a district in Tamil Nadu). This melt-in-the-mouth sweet is made of dal – making it healthy and nutritious. With a preparation time of 15 minutes, maladu is an easy choice for people wanting to make something unique at home on special occasions. Do you love freshly-made, soft, juicy gulab jamun? If you do, then this speciality of Kerala is a must-try for you. Also known as karollappam, this mouth-watering sweet is made of jaggery, banana, rice, roasted coconut, ghee, roasted sesame seeds, and cardamom powder. An easy-to-make delight, unni appam pampers all types of taste buds without the slightest hint of discrimination. Rava kesari is the South Indian version of sooji ka halwa. This bright-orange treat boasts the goodness of saffron and comes with a unique flavour and an appealing aroma. To make this dessert more exciting, you can add fresh fruits and dry fruits of your choice. This mouth-watering mithai perfectly demonstrates the balance between health and taste. This popular pasty is typically prepared during weddings, festivals, and special occasions. Originally from Tamil Nadu, adhirasam is made of rice flour, jaggery, and cardamom. The century-old traditional recipe requires a total preparation time of one week. If you are looking for authentic deep-fried adhirasam, you may find it difficult. Most sweet makers now use modern technology and machines to reduce the preparation time. However, there are still some shops in Tamil Nadu that sell original adhirasam. This soft sweet bread is made of wheat flour, cardamom, turmeric powder, and pure ghee. A must-have during Pongal, this South Indian treat boasts a filling of grated coconut and jaggery. This nutritious delight is easy to make and loved by all ages. This traditional sweet originated in Tuticorin in Tamil Nadu and slowly gained popularity in other parts of the country. The swirl-shaped treat is soaked in three types of syrups (cane sugar, jaggery, and palm sugar), accounting for the unique flavour and taste. This rich delicacy, made of coconut, is perfect for all types of occasions and celebrations. Coconut barfi is a cream-coloured scrumptious treat that boasts an irresistible taste and flavour. Loved by all, this South Indian speciality will surely satiate your taste buds with its uniqueness. Note: Did you know that most South Indian sweets vary in taste in different parts of the same state? The main reason behind this variation is the creativity and subtlety of the makers. The ingredients are never added together at the same time. Every sweet maker has his/her own order of adding the ingredients. The slight changes result in a flavour that remains unique and special. Author’s take: South stands for cultural richness and authenticity. Interestingly South Indian food, including sweets, also carries that invisible stamp of originality and purity. If you are planning to enjoy the real favours of the South, you either need to plan a long trip or make the most of websites such as SaleBhai. SaleBhai lets you discover the regional specialities of India in their most authentic forms. So what are you waiting for? Enjoy the best of South Indian cuisine today! If you are looking for special recipes, click here. This article lists 12 South Indian sweets that you must try. From payasam to Tirunelveli halwa to poli, the long list of mouth-watering delicacies comes with unique flavours and feel. This write-up highlights the special features of each treat, making it easier for you to decide. Have some more sweets that you feel should have been included? Please feel free to drop your suggestions in the comment section.